WW: Tap to bring one artifact from your graveyard to your hand. 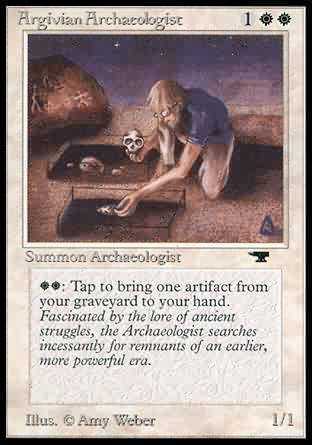 WW, T Return target artifact card from your graveyard to your hand. Fascinated by the lore of ancient struggles, the Archaeologist searches incessantly for remnants of an earlier, more powerful era.